Mumbai, January 22: Discussing on various areas of collaboration in Mumbai, Chairman of the Commonwealth Enterprise and Investment council Lord Marland on Monday met CM Devendra Fadnavis in the presence of Minister Subhash Desai. “Chairman of the Commonwealth Enterprise and Investment council Mr Lord Marland meets CM Devendra Fadnavis to discuss on various areas of collaboration in Mumbai. 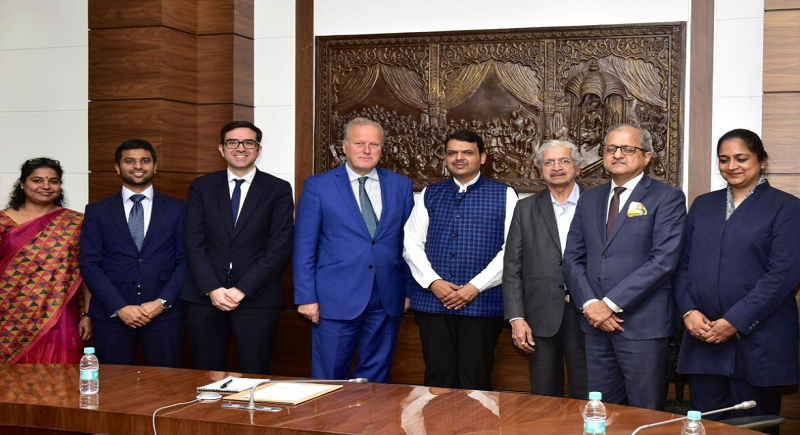 Minister Subhash Desai was present”, tweeted the Chief Minister’s office to which the Commonwealth Enterprises said tweeting, “CWEIC was honoured to meet the Hon Chief Minister of Maharashtra and Minister Subhash Desai”. Established in July 2014, the CWEIC is responsible for organising the Commonwealth Business Forum alongside the biennial Commonwealth heads of Government meeting and Commonwealth Trade ministers meeting on alternative years. It is a not for profit membership organisation with a mandate from Commonwealth Heads of Government to promote intra Commonwealth trade, investment and the role of the private sector across the 52 member countries. Marland, also met the CM of Gujarat Vijay Rupani on the sidelines of the Vibrant Gujarat Global Summit with a view to expand the projects in the state last week.